120 x 90cm - This is a stretched poly cotton canvas, unframed, and can be hung without a frame. The image continues around the side of the stretcher. The side of the stretcher measures 3 cm. Carnival Venice, Girls, Costumes, Gondolas. 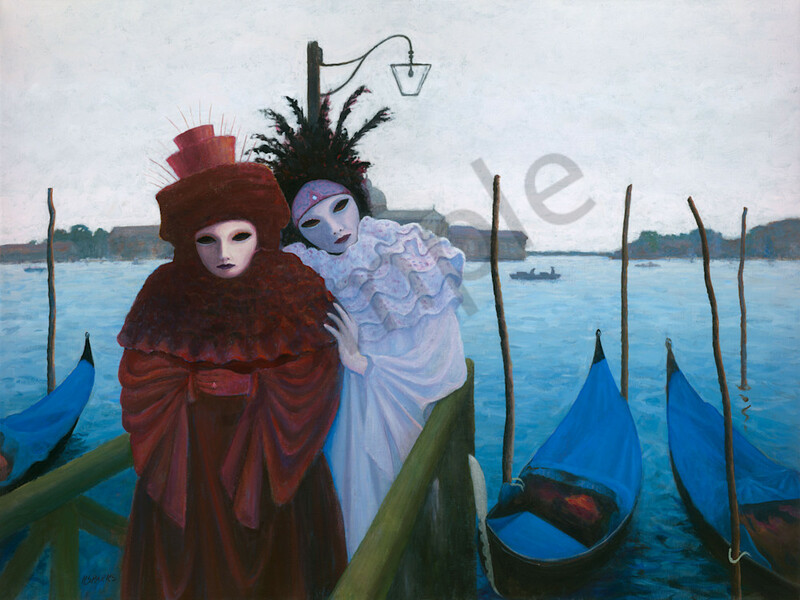 Two girls in beautiful costumes create a wonderful mood as they pose for photographers in front of the Grand Canal Venice.This artwork was inspired by the Venice Carnival. The Venice Carnival takes place during the month of February each year and is truly a time of dreams and intrigue. The earliest evidence of Carnival celebrations in Venice dates from the year 1094 A.D. The carnival ends with Lent, forty days before Easter on Shrove Tuesday, the day before Ash Wednesday.